Monday arrived, gray and drizzly, but that did little to dampen our excitement over what the day had in store. After breakfast Carla and I gathered our things and left the hotel for BioWare. ME: Carla, do you know where the BioWare offices are? ME: Carla, you know where the BioWare offices are, right? CARLA: (vaguely gesturing) Over…..there? Let’s call Zach. Time to randomly go up to buildings and interrogate people who happened to be standing outside. Clearly, David Bass’ definition of “across the street from the hotel,” was a little different from mine. Ahead of me I saw Carla accosting some fellow in a red Sith Empire T-shirt. We were saved! 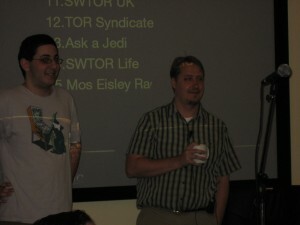 After signing a document promising never to reveal the Secret Room of Secrets or the existence of chocolate rivers, we got nametags and had a few minutes to take pictures and chat with all the other groggy but happy SWTOR fans before Senior Community Coordinator David Bass appeared, full of smiles and energy and good will. David led us into a large room with many computers. The screens were blank, but held so much promise. Stephen Reid kicked the day off with a nice little welcome presentation with rules like STOP TAKING PICTURES NOW. We also saw that fan sites from the U.S., Canada, Great Britain, France, Germany, and Serbia were in attendance. The little blue pushpins on the world map told us so. I noticed the strong concentration of pushpins on the east coast and wondered why the heck all the gaming conventions are on the west coast. Fun fact: while we were not allowed to wander the halls unescorted, we were allowed to use the restrooms without a chaperone. They had actual discussions about this, the bathroom thing, and decided that we could be trusted not to use a fake bio break as a strategy to infiltrate offices and search for evidence of new playable species or the nonexistence of end game. I was happy with this policy since I had downed three cups of coffee at breakfast. Formalities over, we saw our schedule for the day (hours and hours of gameplay, oh my! 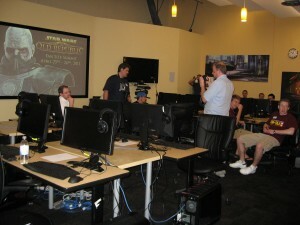 ), then got a visit from SWTOR Executive Producer and Vice-President of Production Rich Vogel and the newly-hired Jeff Hickman, Executive Producer, Live Services. 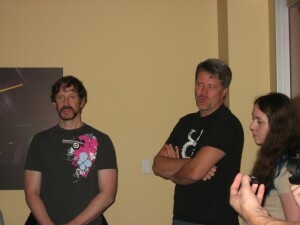 These are BioWare bigwigs and we treated them respectfully by not complaining about swimming or clamoring for a release date. We clapped, they said thanks for coming, they departed. Studio tour time! Using his college tour guide skills, David Bass walked backwards and led us through the narrow goldenrod hallways of BioWare. Artwork on the walls counted as one of the things we were allowed to take pictures of, so there was lots of stopping because there was lots of artwork. 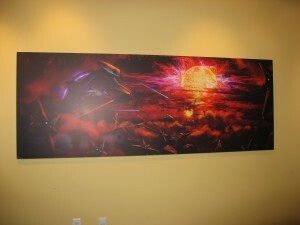 At every new picture, Zach from Mos Eisley Radio said, “Oh MAN I want that for my wall.” Every single one. It was adorable, especially when he asked if he was the only one geeking out over the wall art. He really wasn’t, we all loved it. 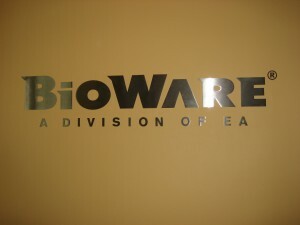 The BioWare offices are composed of long halls which open up into big open areas with desks along the walls or into smaller offices with doors. 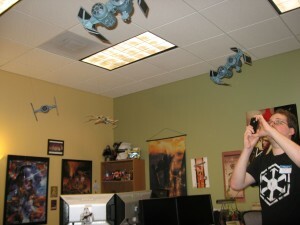 One office had TIE-fighters and X-wing fighters hanging from the ceiling and Star Wars posters covering the walls. It was like an eleven-year-old boy’s dream of what an office should be. Along one section of wall we saw the famous armor sets on display. Pretty! 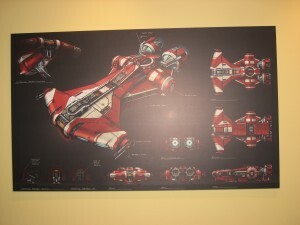 I took some pictures, including one with an incongruous title above the pictures. That one later got erased by Stephen Reid who said it would probably confuse people and cause a furor on the forums. Point taken. Fun fact: Stephen Reid is well-versed in the terrible turn that forum posts can take. He later recounted a story about how he was trying to explain to people that a release date announcement is like Christmas. You can tell it’s coming because you see the signs. You are never surprised when Christmas arrives. Good analogy, except now there are a string of people who think that Stephen Reid is hinting that SWTOR will be released at Christmas. 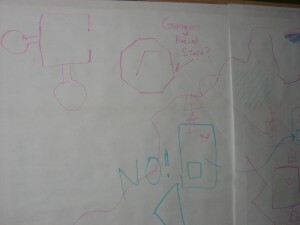 Pink Octagon = "Gungan Racial Start"
Another section of the wall contained one of my favorite things I saw at BioWare. It was a giant piece of white butcher paper covered with scribbling and geometric shapes – a crude representation of a world map. David Bass told us that it was made especially for our visit. The map included a possible Gungan Racial starting area. 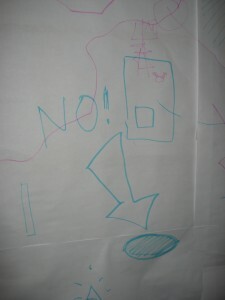 Also, a giant “NO!” pointed to a dark circle that looked suspiciously like a body of water [Editor’s note: this map was clearly intended to be a joke. Please do not start a thread in the official forums saying that Gungans have been confirmed as a playable race.]. We also got to visit NOC (Network Operations Center), where BioWare keeps track of world events that may affect Internet traffic and server loads. A large TV screen is always tuned to CNN because they want to keep abreast of any major events such as the tsunami in Japan or the Superbowl. Someone in our group joked about the upcoming royal wedding. “Actually that is something we watch,” was the reply. Tour over, we returned to the room with all the computers and it was time for the Q&A session with Principal Lead Systems Designer Damion Schubert. Displayed on the screen behind him was the order in which fansites were to come up to the microphone and ask questions. Oh no, we were number three and didn’t have a specific question for Damion. Oh no, the first people passed and now we’re number two. Systems question, systems question……aha! I dimly remembered seeing the words “gear itemization” in some interview he did way back when. I decided to ask him about Dark/Neutral/Light gear, which I had been wondering about. To be sure, I sidled up to Stephen Reid and ran the question by him to see if it was one Damion would be able to answer. Stephen nodded. And now it was my turn. I formed the question in my mind. At this point, Damion was giving me what can only be described as a quizzical look. He tilted his head slightly. One eye squinted a bit and his eyebrows squished down as if trying to take refuge in the bridge of his nose. I began speaking in a manner that bore only a vague resemblance to proper grammar. If I’m lucky, I told myself, maybe he’ll think that English is not my first language. I briefly considered affecting some kind of accent, but decided that would be not only ridiculous but maybe slightly racist. 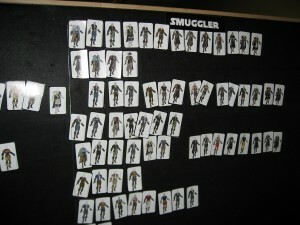 Finally, I somehow spit the question out and Damion launched into a lengthy explanation of what BioWare had planned for Dark, Light, and Neutral gear. It seemed that I had come up with a decent question after all. I was pleased to hear that they were working on gear for strictly neutral players since I am thinking of playing that way, but don’t want to lose out on gear because I don’t skew Light or Dark. As the rest of the fansites asked their questions, I began to realize that Damion likes to make listening faces as people talk to him. He probably wasn’t trying to communicate how ludicrous my question was through the amazing gymnastic ability of his eyebrows. Still, I started to plot how I could leverage my friendship with Brooks Guthrie to allow me to re-record myself asking my question, but using the conventions of correct English. Next up, the Daniel Erickson and Blaine Christine show! Compared to Damion’s measured, thoughtful demeanor, these guys were carnival barkers, but in the best possible way. Full of jokes and one-liners, you can tell these guys love talking to the fans. Daniel is a human sound byte machine. He managed to be funny and irreverent one second, smart and insightful the next. As for Blaine, his enthusiasm for the game bubbled over anytime he could get a word in edge-wise. He loves SWTOR. He would marry it if he could. He’s like an adorable puppy who will chase that ball all day until you need physical therapy for your poor, withered arm. 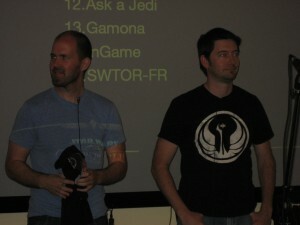 There was a funny moment when Marian from SWTOR.EU did something I did not think possible. He stumped Daniel Erickson. 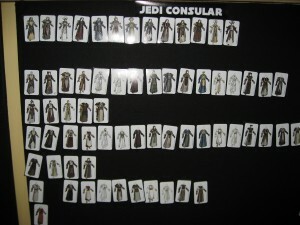 “I want a story-related answer for why lightsabers do not cut off body parts in SWTOR,” Marian demanded. Daniel did that thing where you stall for time by slowly repeating the question. Blaine gamely tried to rescue him, but Marian cut him off with a stern, “Don’t help him!” The general consensus was that there is no good reason. Daniel and Blaine finished the question by pretending to try to cut each other with dull lightsabers. At some point, Stephen Reid muttered something about the time and how Daniel and Blaine needed to stop talking so much so the rest of the fansites could ask their questions. It was tough, though. And we were enjoying the horsing around. Tomorrow Soon: Lunch with the writers, and we finally get to PLAY THE GAME.